However, there is nothing much about the Mi Band 3 except the device name, model number, and the Bluetooth version it will support Bluetooth 4.2 BLE. The model number of the device is XMSHo5M and it will support the Bluetooth 4.2, low every. 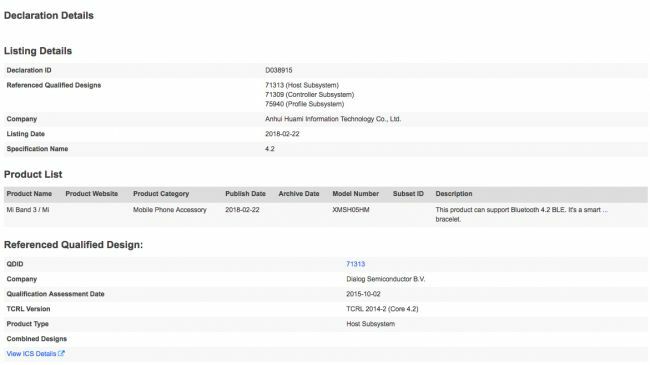 Huami will be manufacturing the Mi Band 3 – the company also manufactured the previous Mi Bands and the Amazfit smartwatch. Nothing about the design of the Mi Band 3 has been cleared or hinted so far, but we are assuming it will come with design refinements, an improvement in accuracy and HR monitoring. The Xiaomi Mi Band 2 was a hit in India when it released but there was nothing much improved or changed from its predecessor. It came with the same rubber strap along with a capsule-shaped tracker which needs to be removed from the band to charge it. The two main USP of the Mi Band 2 which made it a success is the low cost and longer battery. It offered 20 days of battery life on a single charge and came with a small low-res LED display to show minimum information. A smartphone is needed to sync in-depth data of your daily activities. As we don’t have anything about the launch date of this device so we are expecting a sneak peek of the Mi Band 3 at the MWC 2018 as Xiaomi is expected to have its presence there.